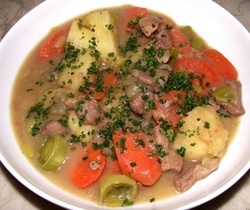 There are a number of recipes for Irish Stew available but what we have tried to do here is make it as true to the original as possible. Obviously things have changed over the years and our ancestors almost certainly would not have made a stock (see below), but then they didn't have to ~ they might not have had much but they did have something many of us can't have today and that is the freshest, totally organic ingredients right beside them. We would imagine that the truest recipe would have included just mutton, barley and potatoes. And it would only have been mutton, not lamb. There are a couple of reasons for this; one, if someone was lucky enough to have a lamb they would not have killed it but allowed it to mature to produce more lambs, wool and even milk. Mutton on the other hand, is from an older sheep and probably past her productive age and not of any use other than food and her coat; secondly the cuts of meat used for Irish Stew would have been meat that wasn't wanted by the more wealthy, typical of any peasant food worldwide, and so it would only have been mutton in Irish Stew. All that said, the practicalities of today means that mutton is incredibly hard to find. One place that you can sometimes find it is in Asian ethnic shops. Other than that you might actually have to resort to using lamb. If this is the case, use shoulder of lamb chops. Ask your butcher to give you them trimmed but not cut into actual chops, ie in one piece of meat. If they are already cut into chops, cut each chop into about 3 chunks of meat per chop. Other things that might have been available on a day on which the stew was being prepared would have been added both for flavour and to save any waste. They would all have had to have been ingredients available locally, very locally and so at various time of the year might have included root vegetables such as turnips, carrots, and onions. Maybe even cabbage would have been added when available and interestingly even garlic as wild garlic as it grows freely in Ireland, as have peas and broad beans for hundreds of years. Various herbs such as parsley and thyme were probably available and would possibly have been added. Alcohol of any kind would never have been added to Irish Stew and should never be added to Irish Stew. Recipes you see nowadays often include, for instance, Guinness. Does anyone really think early Irish people had access to Guinness? And even if they were lucky enough to have access to it, does anyone honestly think it would have been 'wasted' in food or to waste food? No. Certainly not. In actual fact probably the only alcohol poor people in Ireland would have had any access to would have been potin and no Irish mother would have added such a thing to a stew intended for her children as well has the adults. So no alcohol in Irish Stew. As we said above, our recipe is as near as possible to what the original Irish Stew would have been. If you follow this recipe you will have a hearty, unctuous stew. Don't fret about which vegetables to add ~ if you don't have leeks use onions, if you don't have carrots leave them out altogether. If you have some turnip cut it into cubes and add it before the potatoes. Remember, Irish Stew was a peasant dish and those people didn't have the luxury of being culinary purists or food snobs ~ they were simply making the most of what was available to survive. The chunks of potatoes and the barley will thicken the stew somewhat and to thicken it further towards the end of cooking you could use a teaspoon of cornflour (mixed in a cup with a tablespoon of cold water) but a much better way is separately boil 4 potatoes. Once cooked, mash thoroughly and add to the stew about 20 minutes before it is ready. This will thicken it up naturally and very well. While it is not strictly necessary to make your own stock, if you do have the time it is certainly worth the extra effort. Yes, it is time consuming and a lengthy process but it can be frozen and therefore made in advance of the time you will be making the Irish Stew. Added to that, your kitchen will be filled with the most fabulous aromas during cooking! 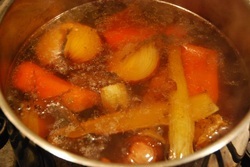 The recipe below ultimately yeilds approximately two and a half pints of stock. 12. To freeze, line a large plastic box or bowl with some cling film and pour the coolliquid into it. Place box/bowl in freezer and allow to set. Once set remove from freezer and lift cling filmed stock out and wrap in a further stretch of cling film and place back in the freezer.